To be remembered . . . In Istanbul, you don’t have to step far, in any direction, before you see a flag, a banner, a poster, a sign, a magazine cover, a sticker, a billboard adorned with Mustafa Kemal Atatürk’s photo. There’s so much I don’t know about Atatürk, but I do know he is revered and loved, still to this day. Today, November 10, commemorates the day of his death in 1938, seventy-five years ago. 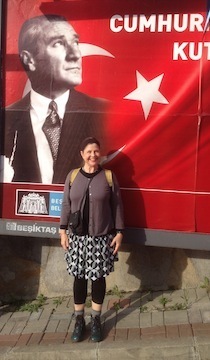 Because the Turkish Republic is so new, the memory of this country’s first president is fresh. As an American, we learn about George Washington, but I’m not convinced that we have such a love affair with his memory as the Turks have with Atatürk. Taken directly from Wikipedia: Mustafa Kemal Atatürk was a Turkish army officer in the Ottoman military during World War 1, revolutionary statesman, and the first President of Turkey. Following the defeat of the Ottoman Empire in World War I, he led the Turkish national movement in the Turkish War of Independence. Having established a provisional government in Ankara, he defeated the forces sent by the Allies. His military campaigns led to victory in the Turkish War of Independence. Atatürk then embarked upon a program of political, economic, and cultural reforms, seeking to transform the former Ottoman Empire into a modern, secular, and democratic nation-state. Under his leadership, thousands of new schools were built, primary education was made free and compulsory, while the burden of taxation on peasants was reduced. He is credited with being the founder of the Republic of Turkey and his surname, Atatürk, means Father of the Turks. October 29 was Republic Day and I got a day off from school. This is the day Atatürk commemorated on the calendar as the remembrance day of the forming of the Turkish Republic in 1923. A school friend and I spent the morning hours of Republic Day at the Dolmabahce Palace. We saw the room where Ataturk died. Every clock around the palace, including the beautiful clock-tower on the grounds, is stopped at 9:05, the time of his death. Today is Sunday, November 10, and a ceremony is planned at the National School part of MEF, where I work, and I’d love to go and learn about Ataturk, but it will be presented in Turkish and I wouldn’t be able to understand. There are a multitude of books written about this great leader and to learn about him is a part of every school child’s Turkish history class here in Istanbul. An understanding of Atatürk and the former Ottoman Empire would have to be included to fully understand our current world, its countries, its boundaries and its wars and its victories. There is no escape from learning about history when you live in Istanbul. It is all around you. It is on the sweet faces of the people in the markets, it is on dusty, cobbled streets, it is up the steep hills surrounded by rock walls, it is down the deep alleys surrounded by architecture and it flows down the river. It is vast, this world history of ours. I’m left with the understanding that the global problems we see in 2013, are the same problems that have always been. All of us, no matter what country, are a part of each other’s history, the history of the human race. Hi! I wish I knew a particular book to have you read on Ataturk. There’s so many!!! What a fascinating person. I’m going to be looking for that old Mel Gibson movie too!!! I can’t wait to see it. Love you! Visit his mausoleum and museum to appreciate the history of modern Turkey. Going to Gallipoli is also recommended….you can follow that with the old Mel gibson film by the same name. It’s all very moving. Hi, Linda…I think his mausoleum is in Ankara right? And his museum (by Taksim Square???) is on my “to do” list. I’ll eventually get to it. I have made an Australian friend and she has told me about Gallipoli; I would love to go there. It sounds like the way I imagine Normandy, France to be. I wasn’t aware of the movie…I will totally try to watch it. Thanks!